Hi, welcome to Vienna! Wien (its name in German) is the capital of Austria. It is one of the most beautiful cities in Europe. In Vienna you can admire the imperial architecture, and visit the places that influenced some of the most famous classical musicians: Mozart, Beethoven, Schubert, Strauss, Brahms, etc. If you come with me, Ill take you on a Photographic Tour of this city. 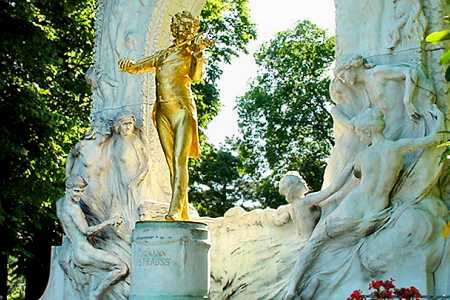 We will begin the tour in the Stadtpark (city park), in front of Johan Strauss Denkmal, one of the symbols of Vienna. This memorial is a work of Edmund Hellmer, but its not the only monument in this park. There are more monuments dedicated to other Austrians: to Schubert, to Anton Bruckner, to Lehar and to Robert Stolz. The park itself is a must see in the capital of Austria.